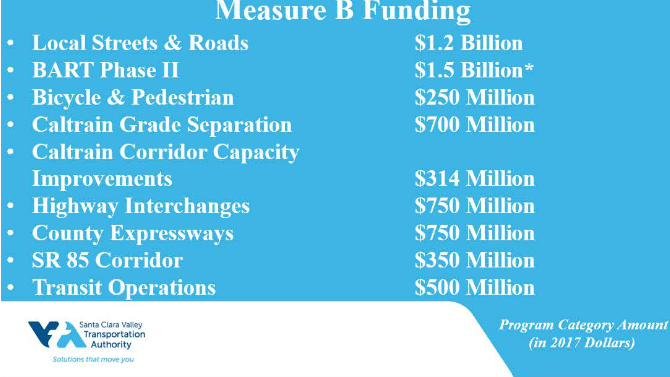 After the overwhelming passage of the 2016 Measure B, with close to 72% of the vote, VTA has been busy laying the groundwork to fund the myriad of projects approved by the voters as transportation priorities for Santa Clara County. These projects range from local streets and roads repair, bicycle/pedestrian improvements, and building Caltrain grade separations to funding Phase II of the BART extension. Collection of the ½ cent sales tax began in April 2017 and as VTA was preparing to distribute the funds, an appeal of a previously dismissed lawsuit regarding the 2016 Measure B was filed. Specifically, in January 2017, a Saratoga resident individually filed a lawsuit against VTA on the validity of the 2016 Measure B. (Cheriel Jensen v. Santa Clara Transportation Authority, et al.) VTA challenged the lawsuit as lacking merit and the court agreed and dismissed the case. We recently learned that the plaintiff just filed an appeal of the court’s dismissal to the 6th District Court of Appeal. As a result of the ongoing lawsuit, VTA is required to keep all 2016 Measure B tax collections in an escrow account (which VTA has been doing) “until the legality of the tax is finally resolved by a final and non-appealable decision…” (California Revenue and Taxation Code, Rev. & Tax. Code § 7270(c).) Therefore, the court process impedes VTA from distributing any 2016 Measure B funds, as was planned for this fall. VTA Vice Chair, Mayor Sam Liccardo. VTA is committed to meeting the transportation needs of the residents and businesses of Santa Clara County and stands ready to begin delivering the voter approved projects and programs contained in 2016 Measure B as soon as the lawsuit is resolved.